Linda at ReThink Design (right here in Sweden) was featured in a Blue Velvet Chair interview a couple of weeks ago. I like to dive into an interviewee’s sites to find pictures that speak to me to include with the interview. 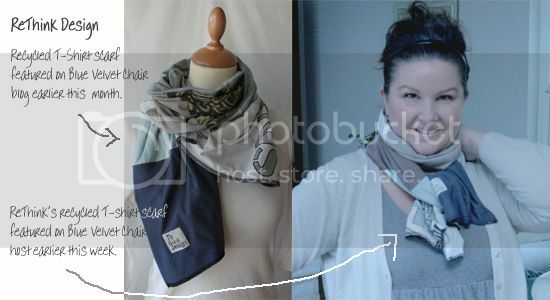 Evidently this recycled T-shirt scarf spoke very loudly…because the next day I went back online and ordered it! And it feels so good! Good because it is ridiculously soft. And good because it was handmade. Win…and win!